Plan on putting a pool or spa in your backyard? We can install the lighting, hook up equipment, and install a control system to fully automate the pool. No fan is too big and no ceiling is too high! 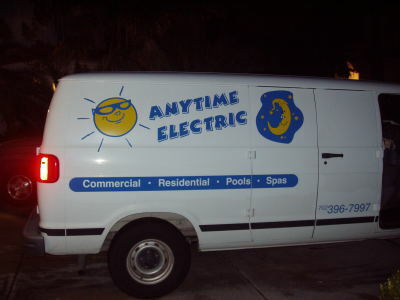 Just give Anytime Electric a try! Recessed lights or TV on the wall! Anything that requires electricity, we do it all! From replacing a ballast to design building your new office, Anytime has been doing commercial projects over 20 years! Need a fan installed, extra power in garage, or new lighting in the livingroom? Residential or commercial we will come right out as quick as we can! Solar PV panels are a great alternative source of power. Please inquire about installation and rebates. Need more power for that pool or addition? We can upgrade your panel any size approved by NVE.